Ear surgery, or otoplasty, is usually done to set prominent ears back closer to the head or to reduce the size of large ears. It can also repair damaged earlobes from years of wearing heavy or large earrings. For ear pinning surgery, the operation is done on children between the ages of four and 14. Ears are almost fully grown by age four, and the earlier the surgery, the less teasing and ridicule the child will have to endure. Ear surgery on adults is also possible, and there are generally no additional risks associated with ear surgery on an older patient. If you’re considering ear surgery for yourself or your child, this information will give you a basic understanding of the procedure. A personal consultation with Dr. Newen is the best way to obtain the additional information you will need. Large or stretched earlobes, or lobes with large creases and wrinkles. During the consultation you will be asked about the results you expect to achieve from ear surgery. This will help Dr. Newen understand your expectations and determine whether they can realistically be achieved. Dr. Newen recommends that parents stay alert to their child’s feelings about protruding ears; don’t insist on the surgery until your child wants the change. Children who feel uncomfortable about their ears and want the surgery are generally more cooperative during the process and happier with the outcome. 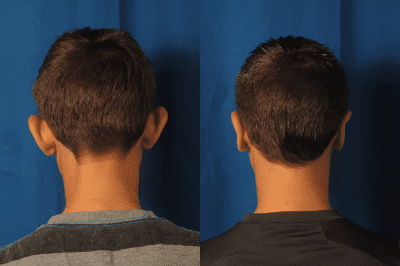 How will Dr. Newen evaluate me for ear surgery? With one of the more common techniques, Dr. Newen makes a small incision in the back of the ear to expose the ear cartilage. He will then sculpt the cartilage and bend it back toward the head. Non-removable stitches may be used to help maintain the new shape. Occasionally, Dr. Newen will remove a larger piece of cartilage to provide a more natural-looking fold when the surgery is complete. Ear surgery can be done under local IV sedation or general anesthesia. Significant complications from the ear surgery are very rare. Anyone considering surgery, however, should be aware of both the benefits and risks. The subject of risks and potential complications of surgery is best discussed on a personal basis during your consultation with Dr. Newen. After surgery, there may be a temporary feeling of numbness, pain, swelling, and bruising. The types of symptoms experienced and the duration of the symptoms vary in patients. The patient’s head will be wrapped in a bulky bandage immediately following surgery to promote the best molding and healing. The ears may throb or ache a little for a few days, but this can be relieved by medication. Our goal is to make your surgical experience as easy and comfortable for you as possible. If you’re a smoker, you will be asked to stop smoking well in advance of surgery. Aspirin and certain anti-inflammatory drugs can cause increased bleeding, so you should avoid taking these medications for a period of time before surgery. You will be provided with complete preoperative and postoperative instructions. Any activity in which the ear might be bent should be avoided for a month or so. Most adults can go back to work about five days after surgery. Children can go back to school after seven days or so, if they’re careful about playground activity. You may want to ask your child’s teacher to keep an eye on the child for a few weeks. Ear surgery is performed at Huntington Surgery Center, our outpatient surgery facility located within The Image Center. Please be sure to arrange for someone to drive you home after your procedure and stay with you for at least 24 hours. Most patients, young and old alike, are thrilled with the results of ear surgery. But keep in mind, the goal is improvement, not perfection. Don’t expect both ears to match perfectly-perfect symmetry is both unlikely and unnatural in ears. For more information on ear surgery or to schedule a consultation, please call our office at (714) 230-2430.